Nissan updates GT-R performance car | What Car? Nissan has upgraded the GT-R with some subtle tweaks under the skin and audio-visual advances in the cabin. Nissan says adjustments to the GT-R's springs and shock absorbers make the ride more comfortable and the handling more dynamic. Slightly stiffer rear suspension settings improve feel and responsiveness during cornering. Other tweaks include adjustments to the way the gearshift works in automatic mode, and improvements to the cooling systems. The electronic brakeforce distribution has also been tweaked to shift bias towards the rear to give greater braking stability in dry conditions. The GT-R's emissions have been reduced by 3g/km to 295g/km and the car is now Euro V emissions compliant. Exterior changes are as subtle as a coat of lip-gloss, with the bumpers getting a double coat of clear paint to enhance the colour finish. Inside, the speedometer and rev counter are given gun metallic finished surrounds. Better insulation has been fitted to the rear seats to improve cabin comfort. 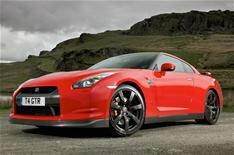 Since September, the GT-R has been sold with Nissan's latest audio and navigation system the first car in the range to get the new equipment. The hard-drive navigation system includes maps of Turkey, Eastern Europe and Russia, with easier-to-follow guidance and a new seven-inch screen, which can be operated by touch or voice control. The hard-drive will store music from up to 300 CDs, and the system has MP3/USB connectivity, which can be operated through the steering wheel controls.